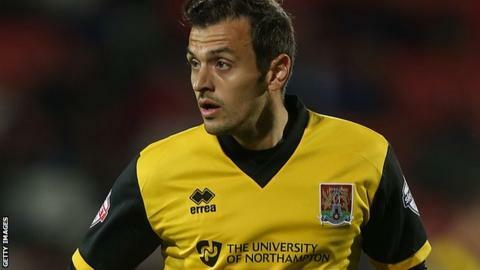 Northampton Town have recalled striker Alex Nicholls from his loan spell at League Two rivals Exeter City. The 26-year-old joined the Grecians on a short term deal in September, scoring one goal in six appearances. Cobblers boss Chris Wilder told BBC Radio Northampton: "He's been away and done great. It's no coincidence that they've got results as well. "We never thought we'd keep him out there for three months. He'll come and be involved [versus Portsmouth]." The former Burton and Walsall forward scored the winner in Exeter's 2-1 win at Cambridge, and they have won four times and drawn once in the six games Nicholls has been involved. Northampton's top-scorer Marc Richards is returning from a hamstring injury, whilst Emile Sinclair has not featured since late August after picking up an ankle injury. The Cobblers are also missing Zander Diamond, Matt Duke, Danny Alfei, Ian Morris, Evan Horwood and Lewis Hornby although Kelvin Langmead returned to the bench against Wycombe. "Our injury list is well documented," added Wilder. "It's important we keep the group strong. We've got a few coming back, which will be good for the group, and hopefully Alex can come back and pick up from his performances at Exeter."